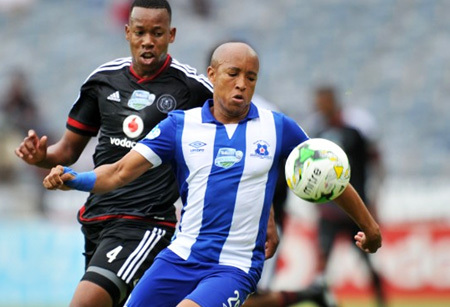 Maritzburg’s Telkom Knockout campaign for 2015 came to an end after they lost 2-0 to Orlando Pirates in a quarter-final clash in Soweto on Saturday afternoon. United had the best chance of the opening stages when after 15 minutes Ryan de Jongh delivered a great ball in search of debutant, Mphakamiseni Nene, but Bucs keeper Siyabonga Mpontshane was able to clear. Kermit Erasmus opened the scoring with a powerful shot from a tight angle in the 25th minute following a flick on by Thamsanqa Gabuza. Three minutes later, Kurt Lentjies nearly responded when he beat Siyabonga Sangweni before slipping up in the box trying to take a shot as Mpontshane was able to collect easily. Kwanda Mngonyama was close to finding an equaliser on 34 minutes from a great delivery down the left but his header went wide off the far post with Mpontshane stranded, John Paintsil then having a header cleared off the line as the Team of Choice did their utmost to get back in the match. But two minutes into the second half Pirates were awarded a penalty when Paintsil committed a foul on Erasmus. Mpho Makola’s penalty was denied by Vries but the Bafana Bafana player netted on his second attempt. Again Maritzburg refused to give in, but they were unable to break down a determiend home defence, with goalkeeper Mpontshane in fine form. Sheldon Van Wyk was also denied a penalty, while in the 84th minute Lentjies got behind the Pirates but his shot went narrowly wide.